Making its debut at Mercedes-Benz Fashion Week yesterday morning, Vera Wang’s Fall 2013 Ready-to-Wear collection was an “exploration of classical dressmaking in sculptural silhouettes.” The world’s top fashion editors such as Anna Wintour, Grace Coddington, Nina Garcia and celebrities such as Jada Pinkett Smith, John Legend, Chrissy Teigen and Christine Baranski sat front row center as a mix of textures, colors and patterns made its way down the floral runway. Click here to view the complete Fall 2013 collection. 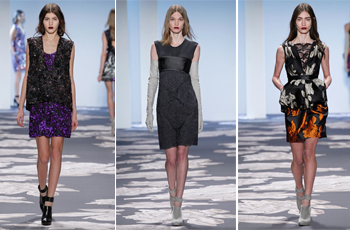 And don’t miss the stunning looks from Vera’s Pre-Fall 2013 collection at verawang.com. This entry was posted in Fashion, Fashion Designers, Vera Wang and tagged Collection, Fall 2013 Ready-to-Wear, Pre-Fall 2013 collection, Vera Wang. Bookmark the permalink.